MyPreferences Blog: What do Chick-Fil-A, Comcast and MassMutual Have in Common? What do Chick-Fil-A, Comcast and MassMutual Have in Common? On paper, it would seem that a leading quick-serve dining chain, the nation's largest cable provider and one of the oldest and most respected life and health insurance companies would have very little in common. But if you take a closer look, you'll see that all three are taking very innovative approaches to customer engagement and leveraging groundbreaking tools to create personalized experiences. In that respect, they share many of the same challenges and opportunities. And that's why all three companies sent senior executives to speak at last year's CEM Summit. Chick-Fil-A's Michael McCathren spoke about how investing in relationships leads to loyalty and profitability. Comcast's Jane Bulman led a discussion on new regulations governing marketing to mobile devices. MassMutual's Kris Gates presented on Voice-of-the-Customer research and how it led them to adopt new engagement strategies. Three very different companies united by a shared goal – to engage customers with personalized messages that are based on preferences and in alignment with privacy protections. And that's what makes CEM Summit so special. It gathers a diverse group of speakers and attendees and focuses their collective energy in a way that is truly unique. CEM Summit 2014 is seeking dynamic speakers to join our conversation on personalization, preferences and privacy. To submit for a presentation, click here. As we approach CEM Summit 2014, consider your company's approach to these issues and what it might gain from being a part of the dialogue. If you have a compelling message or case study to share, we'd welcome a submission to speak. 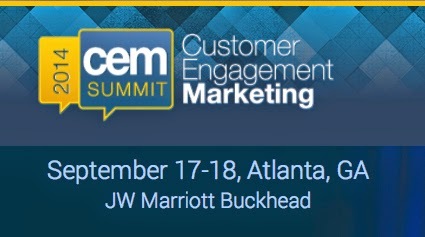 I can't wait to see who takes the stage September 17 and 18 for CEM Summit 2014!